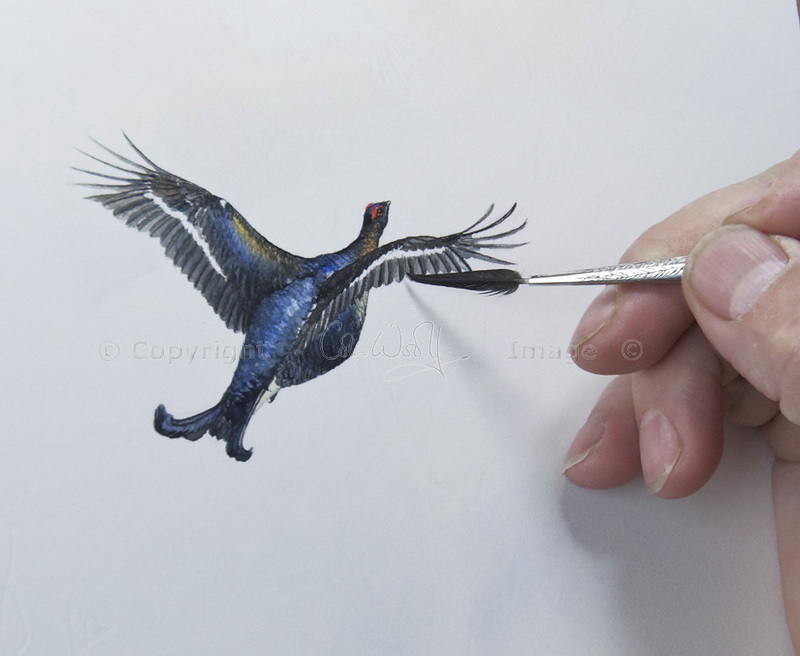 Colin’s latest self-imposed challenge has been to create a larger-than-usual pin-feather painting, using the feather of a black grouse instead of a woodcock. 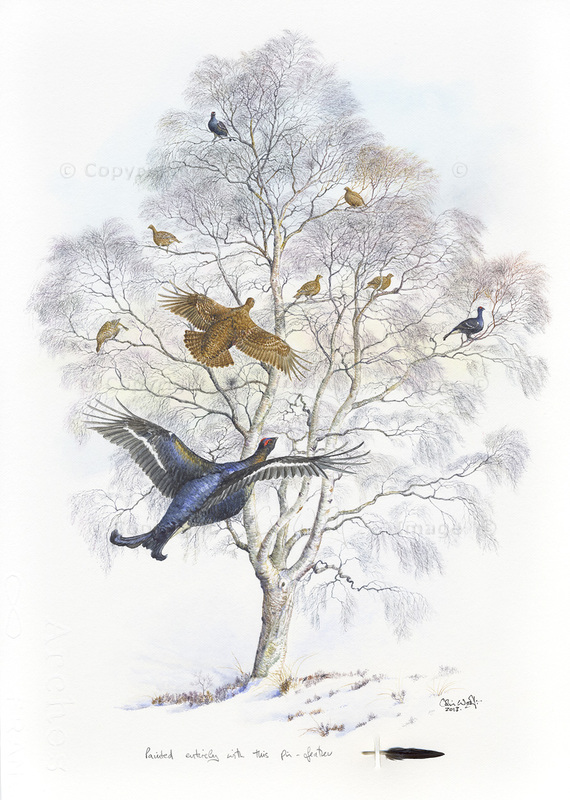 You may remember he created a small vignette of a black grouse in his ‘Olympic challenge’ last year, which combined the pin-feathers of five game birds into one painting. This latest painting is much bigger – 11 inches high by eight inches wide – and it is the largest single painting in terms of size that he has ever painted with a pin-feather of any kind. He had forgotten just how floppy and unmanageable the black grouse feathers were, but it all soon came flooding back! I love this picture simply because it is so different – the tree itself, a beautiful silver birch, almost steals the show because of its graceful shape and delicate, lace-like branches. Quite how Colin achieved this intricate effect is impossible to say. Thank you, Lyn! I love it too. It was quite intensive but he is pleased with the result. Ridiculous! Meant in the best possible way, I hasten to add. I never stop being amazed. How can I get patience like his? Skill is another thing altogether but his patience and dedication to the task bowls me over. A beautiful end result, too. 🙂 I know, it kind of defies understanding, doesn’t it? Colin wouldn’t really call it patience, either – it’s more like a compulsion! Thank you so much – we love it, too! I have been astonished by all his pin-feather paintings. 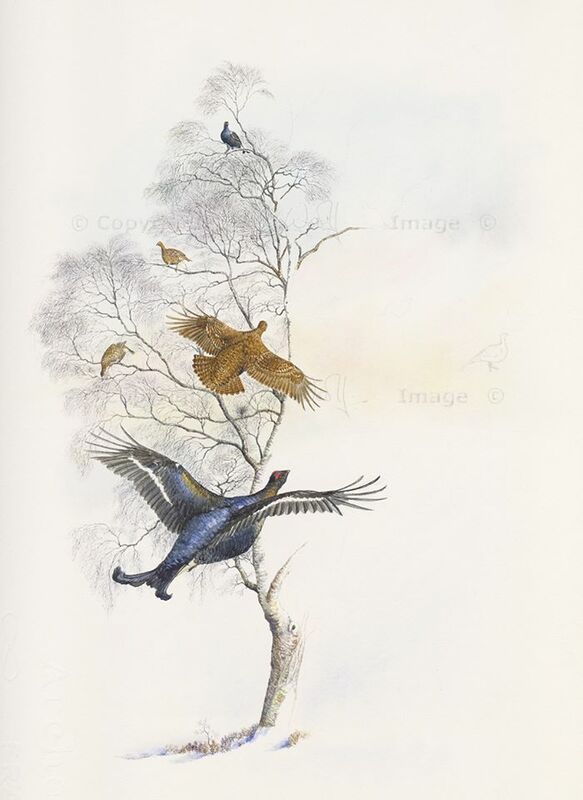 This one has a feeling of a myth, or symbolism of some sort: the ethereal tree full of birds flying to it for shelter. Beautiful. P. S. We saw quite a lot of blackgame up on the hill at the beginning of the week. It seems to have been a good year for them. Thank you! I have the same feeling about this, it’s as if the tree has some kind of deeper meaning. It does have a slightly different feel from most of his pin-feather paintings. That’s very good news about the blackgame – we haven’t been up there for a long while, and we were only saying recently that it would be good to go and have a look for them. How exquisite!. It is so difficult to achieve the real sense of flight, which Colin has so masterfully brought to life. Lovely colours and lines, beautiful birds and tree. Watching the video was fantastic, Thank you and congratulations!. Thank you very much, Carmen! Yes, he has captured the sense of flight perfectly, I think. The feather was a real challenge, but he has turned it into a beautiful picture. What yo say more… ‘Amazing’ word isn’t enough. ‘Stunning’ perhaps helps a bit, but again isn’t enough. I wrote this many times but I’ll be saying it: it’s amazing when you watch the finished painting, but if you try at least to write your name using some ink and a feather, then you will realize how hard is to paint such a beautiful painting. That is very true, Cornel! It’s hard enough writing your name with a brush! Colin would say: belief is key. He believes he can do it, so he does it. It’s not a case of ‘I’m going to try’ – he says ‘I’m going to do it’. Thank you for your comment, and Colin says thank you too! I’m glad you showed the progression of this work of art. Colin is masterful at capturing the nuances of flight. Thank you! It is amazing to see the picture in progress. I was given the responsibility of videoing him, haha! This image has stayed on my mind, as it evokes memories of when I was a child. 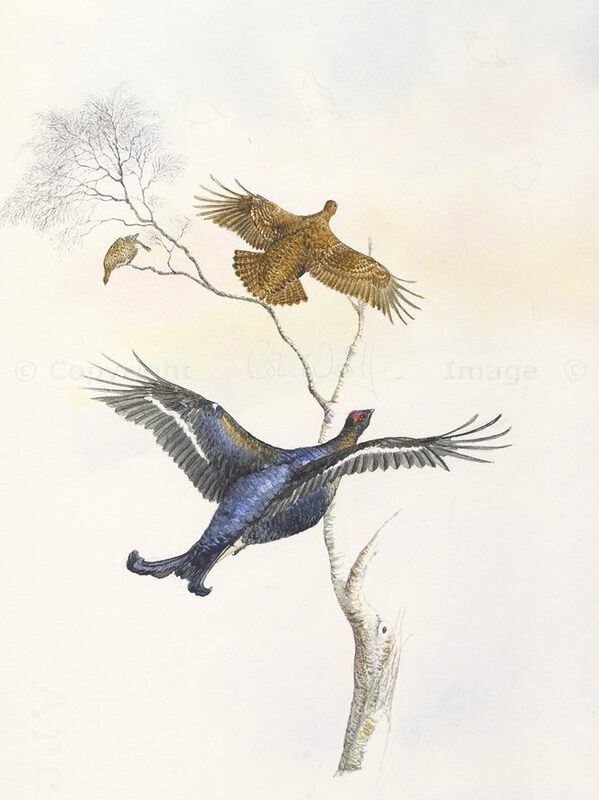 Although we didn’t have Black Grouse, many times as a youngster, we would have pheasants in the orchards around us, that were only visible during the winter months. I can still feel the cold and brisk wind on my face as I went about doing my barnyard chores. Feeling alive and energetic (as only the young can do) and eager to embrace life. Then going back into the house where the warmth of the wood stove would thaw out my hands and nose. I think this has to be one of my favorites, but all of his paintings stir something within. Thank you for sharing this with us. That is a lovely memory! I’m really glad you like this one so much. I think it’s beautiful, too – thank you for your comment! That’s such a beautiful painting, and then I read that it’s all done with a feather. Truly wonderful. That’s very kind, I’ll pass that on to Colin – thank you! It really is a unique painting.